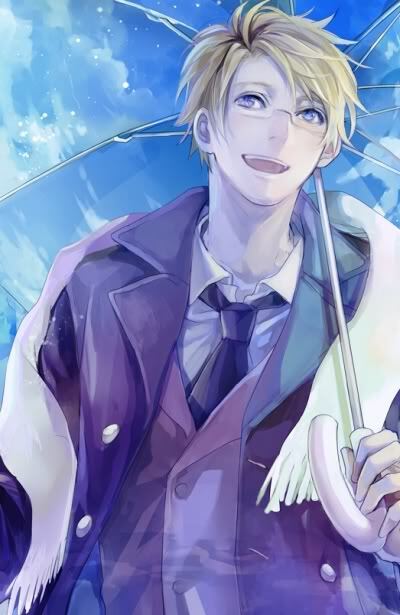 The first thing one notices about Alfred would be his bright warm sky blue eyes resting on a pleasantly smiling face. Al stands at an average height of 5"9, skin slightly tanned from long hours under the sun. He has some muscles, though not enough to be called buff. The way he moves, talks, and pretty much everything about him screams ‘energy’. His short golden hair is perpetually stuck in a state between neat and messy. In front is a cowlick that refused to be tamed no matter what. Alfred’s pure white wings are kept clean and neat, not for vain purposes but so that he can fly without being hindered in anyway. His wings are slightly more pointed than the rest, allowing him to make sharp and swift movements during flight. When in disguise as a human, Alfred dons a pair of half framed glasses. (He likened himself to Clark Kent. Got to hide his identity.) He usually wears a casual t- shirt, often in bright eye-catching colors, with jeans; completed by a brown bomber jacket with the number 50 in a large white font on the back that he’s rather fond of. Alfred is a person of extreme emotions. Whatever he’s feeling, he would broadcast it to the world. He’s known for being an all around happy person; loud and energetic. (and a tad bit too much to handle at times) To people’s annoyance, Al loves to meddle in others business. He does really try to solve their problems for them but sometimes end up making it worse. To others, Alfred many appear to be absent minded, easily distracted, or childish; all in all, an incompetent person. However, he takes his duties seriously and finishes it without fail. Even though he doesn't always show it, Alfred has the ability to read the atmosphere. When the occasion calls for it, he can be completely serious; his actions deliberate unlike his usual spontaneous quirks. Every once in a while, Alfred would be up to mischief. A way to keep his life from being a boring routine, he reasons. It’s all done in good humor though it gets him in trouble with the more serious angels. Alfred is gifted with immense strength, far stronger than the average angel, which makes him a scary opponent in combat. Roughhousing with Al is a reoccurring nightmare for angels. During his stay on earth, Alfred picked up a few quirks. He loves the food the humans have, especially the fast food restaurant named McDonalds. The fast developing technologies never ceased to amaze him as he tries to keep up with it. They proved rather useful to his duties. Ever since his creation, Alfred was surrounded by other angels he considered as family. He shared his joy with them, helped anyone who needed it (whether they wanted it or not), and praised the Lord for all was good. Being just a common angel among thousands has its woe. Alfred soon felt suffocated. He didn’t want to be just another face in the crowd; he wanted to stand out from the rest. To do so, Alfred took on more duties; worked harder than before not for the praise but for recognition. Eventually he was taken in as an apprentice by Arthur, whom he affectionately calls Iggy. The man became a fatherly figure to him. For a while, everything was good for him again. Alfred didn’t consider himself higher than his friends, being just an apprentice is nothing to boast about, but it gave him a feeling of having an identity. He never expected it to end so suddenly. The Battle of Heaven shocked Alfred to the very core. And what shook him even more was to see his mentor among the rebels. But nonetheless, he remained truthful and helped drive the rebels out of heaven and down into the abyss of hell. On that day, he wept. For the fallen, for the people he had to harm, for all who fought and hurt. Alfred couldn’t bear to take up the position his mentor left behind and for once in his existence wanted not be noticed. Suspicion arose that he, too, would soon join to fallen. To prove them all wrong, Alfred stepped up to take his place and worked hard as ever. Time doesn’t really heal all wounds but it worked wonders. With his duties to distract him, Alfred soon returned back to his normal jocose self. Yet something was just not quite the same. The weather seemed to reflect the chaos around them. Grim gray skies loomed overhead a mass of figures, alike in appearances but opposite in intentions, who clashed against each other in a deadly dance. The peaceful silence was long shattered by the clangs of weapons. Alfred barely ducked an incoming sword, the blade making a fine thin line of red on his cheek. Jumping away from the opponent, he readied himself for the next attack. The opposing angel circled him slowly, staring him down like a predator. He charged; Alfred swung down his weapon. Hammer met body and the rebel flew backwards from the force and disappeared into the crowd surrounding them. Alfred lifted his weapon once more and slung it over his shoulders. In all his years, his hammer had never felt so heavy. Deciding the skirmish was over, Alfred ran back to where the most action was, hopeful to help out his brethrens. He ran past those who seemed like they were able to hold it on their own when a blur of familiar blond and intense green stopped him dead in his tracks. In war, he knew it could be fatal to freeze up like that but his legs were rooted to where he stood. A foreign emotion tugged at his heart; Fear. He couldn’t turn around to make sure. Questions barraged his mind. Why? How? Why?! Denial. It couldn’t be. It can’t be… He…. He’s…..
Then came the second emotion, threatening to swallow whole and drown him. Why is this happening? Everything in heaven was so perfect back then, why did it all change? Angels he considered comrades now turned against each other, fighting without holding back. What will happen to them? Why did He allow this to happen? A sudden blow to the head came out of nowhere and knocked Alfred off his feet. He skidded to a stop some distances away, the throbbing pain on the back of his head barely noticed. His mind was racing, scrambling to find a reason, something, anything for all of this. Why was he fighting the ones he love? Why is this happening? Closing in the first reason he could think of, whether it was right or wrong, Alfred got up and joined the fight once more. Everything happens for a reason. He thinks. Everything is planned by Him. If He willed this to happen, then it will.